The back problems continue as do the exercises and the painkillers. 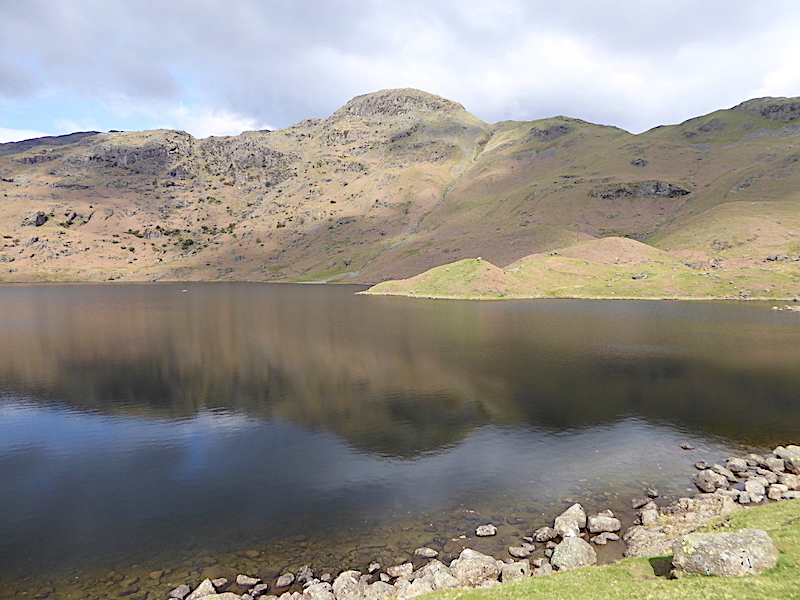 Meanwhile a decent day for a walk turned up so we thought that the short walk up to Easedale Tarn might help free up whatever is causing the problem and maybe aid the recovery process. Apart from that its a whole lot more interesting and enjoyable than sitting on a mat and repeating the same exercises over and over. 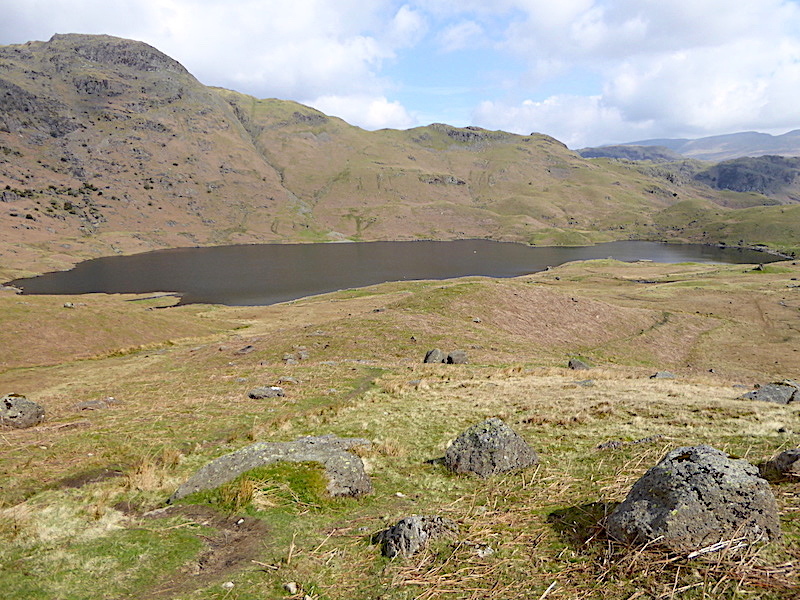 We decided that on reaching Easedale Tarn we’d assess how the back problem was and either continue or return accordingly. The Eden Valley was bathed in sunshine when we left home this morning and drove towards Keswick but, as is often the case, as we approached Blencathra on the A66 we could see plenty of heavy cloud swirling around the fells ahead of us. Blencathra was shrouded in swathes of the stuff and we could well imagine the thoughts of the walkers getting ready beside their vehicles in the various lay-bys below it. 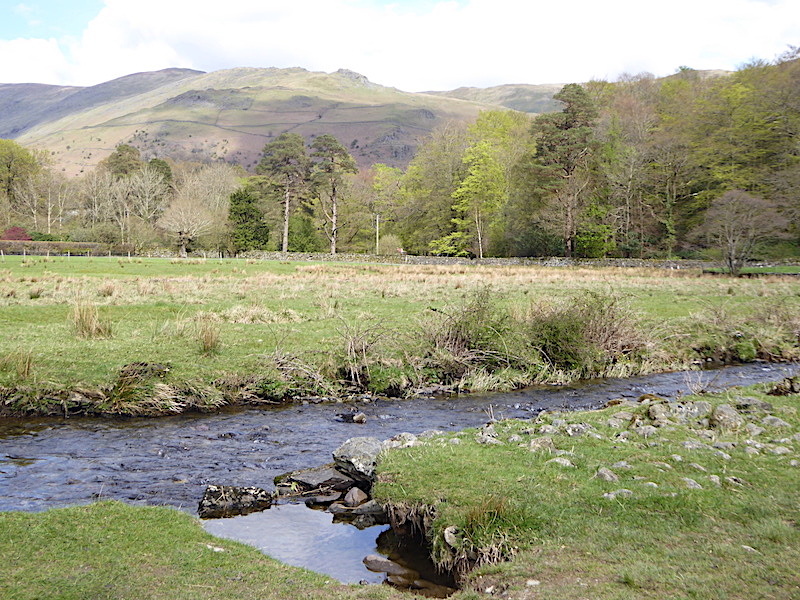 We were also thinking similar thoughts as we turned off the A66 and headed south towards Grasmere, perhaps we should have stayed in the east, perhaps it will burn off as the sun get higher, perhaps we’ll spend our time staring at dull grey skies and so on. 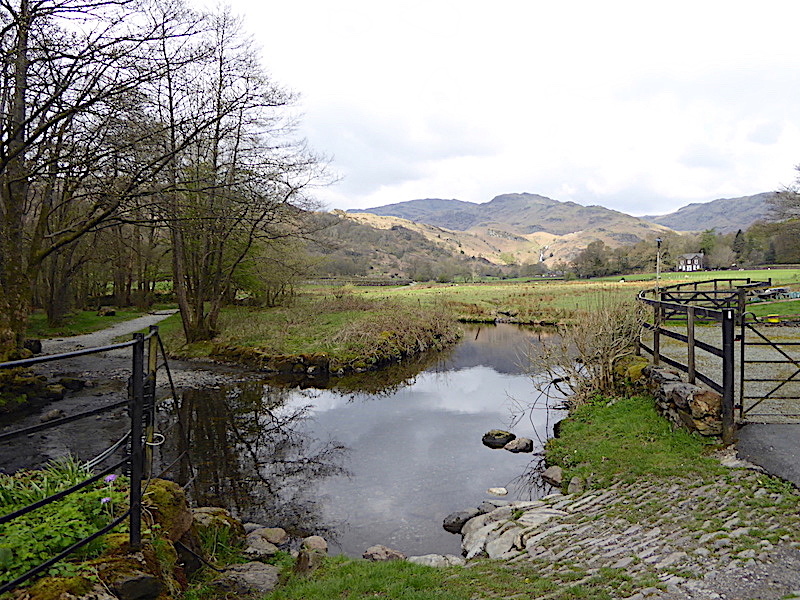 However, when we arrived, Grasmere seemed to be having its own little spell of fair weather and things were calm and sunny as I took this shot beside Easedale Beck looking into Easedale. 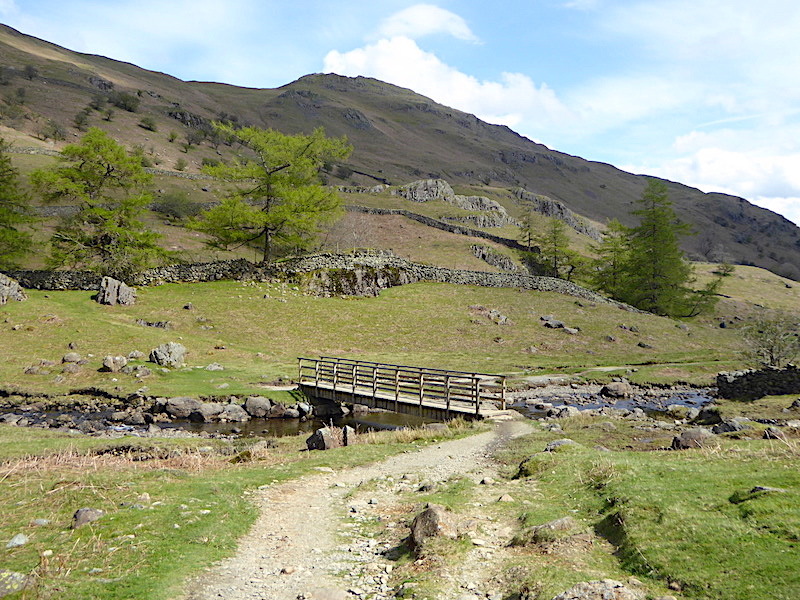 We cross the beck by the footbridge, just out of shot to the left, and make our way into Easedale along the footpath over on the left. 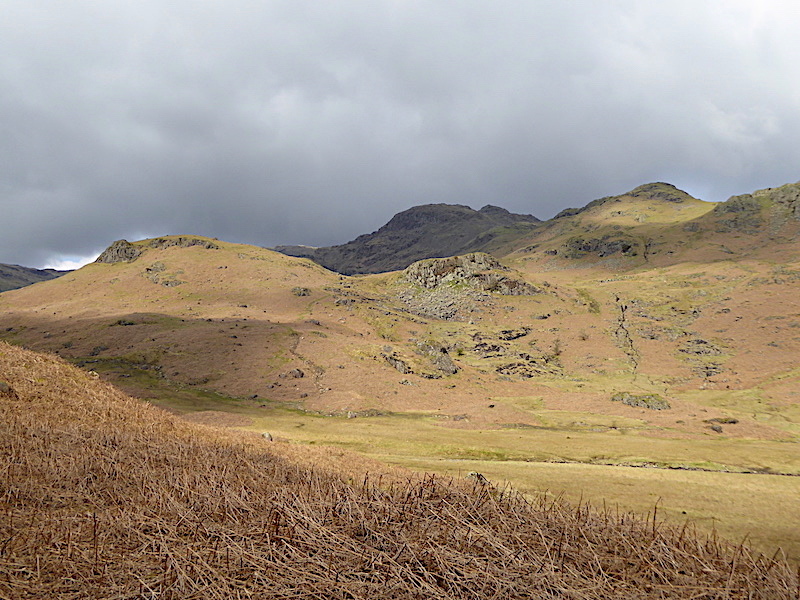 To our right across the fields Helm Crag is bathed in sunshine …..
….. while ahead of us Tarn Crag is temporarily in the shade. 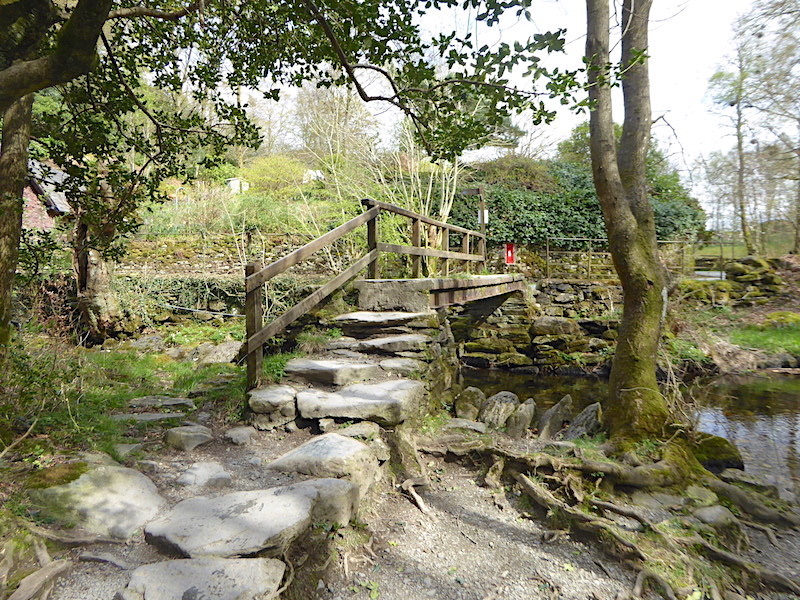 The laid stone path along here is OK, but we’re always pleased when it comes to an end. For some reason neither of us find it particularly pleasant to walk over, maybe because its a little uneven, or perhaps its the way the stones have been laid. Whatever the reason is I generally choose to walk the more even grassy verges especially today as my back can do without any unnecessary jolts. 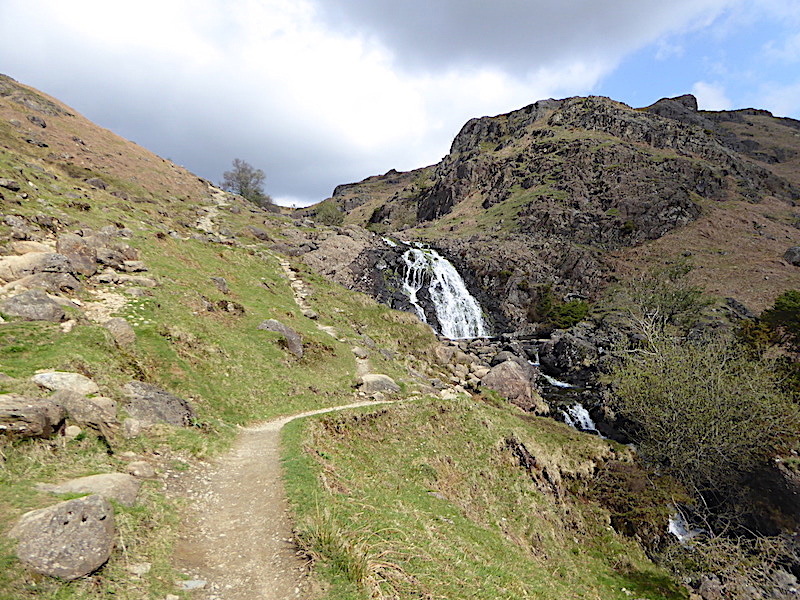 The path is much more user friendly as we progress along Easedale towards the waterfalls in Sour Milk Gill with Ecton Crag on the right of them and Brinhowe Crag to the left. From this point the path carries on behind and alongside the wall coming in from the left of the shot and then out into the open, passing to the left of the falls as you look at the shot. There’s no-one on the open path by the falls but as we carried on up beside the wall a group of walkers came down towards us. As we met up we offered our good mornings to them whereupon one of the lady members of the group began looking at her watch and asking “Is it still morning. 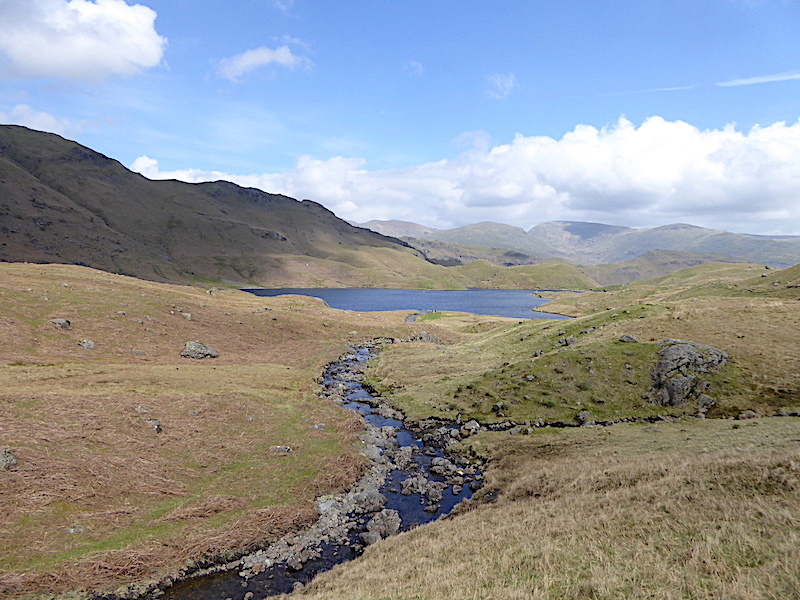 ?” None of the group had backpacks or camping equipment so we could only think that, as it wasn’t yet 10.00 am, they must have had an early walk up to the tarn and were now returning back to Grasmere. Perhaps she felt as though she had been out walking much longer than she actually had. 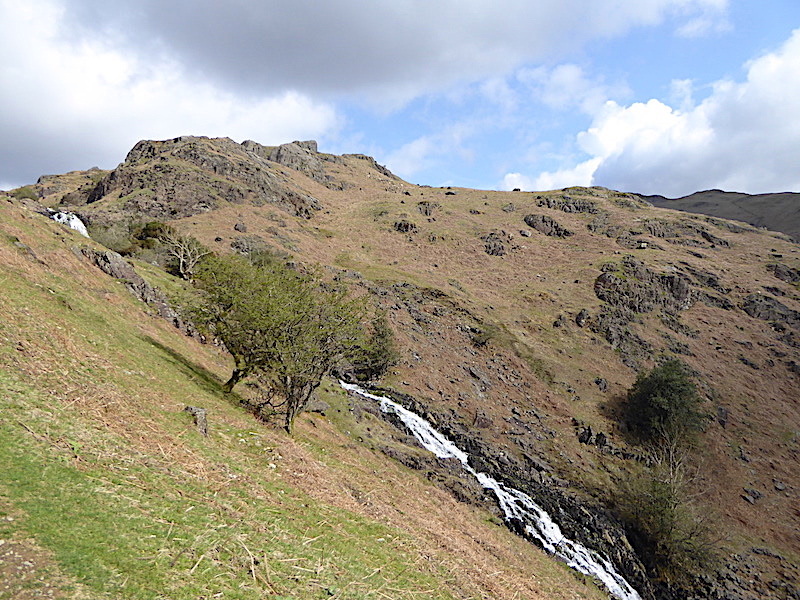 We reach the path along the open fellside with Sour Milk Gill plunging down the craggy ravine and on towards Grasmere. Somewhere along here we met yet another group of walkers coming down, none of them were carrying packs either, so possibly another group of ‘after breakfast’ walkers taking advantage of the early morning good weather. 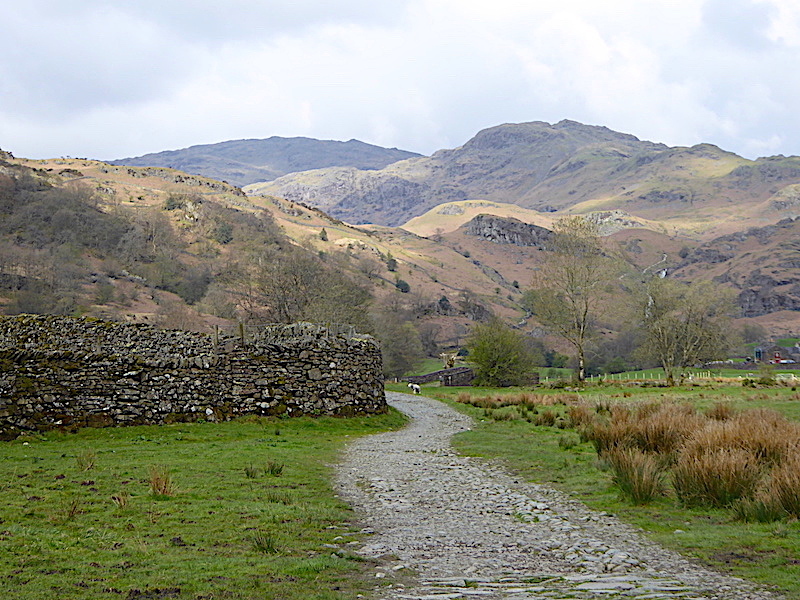 Strangely, for such a popular little walk from Grasmere, every time we looked back along the path there was no-one else coming up behind us, and that is really unusual. 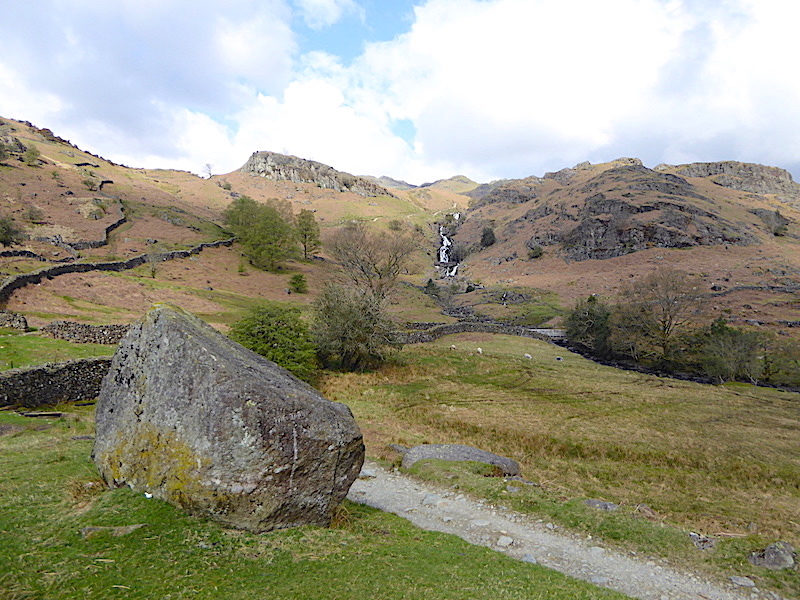 A little detour from the main path over towards the falls …..
….. for a closer look, as I always do …..
….. and then back up onto the path for a look down, again as I always do. 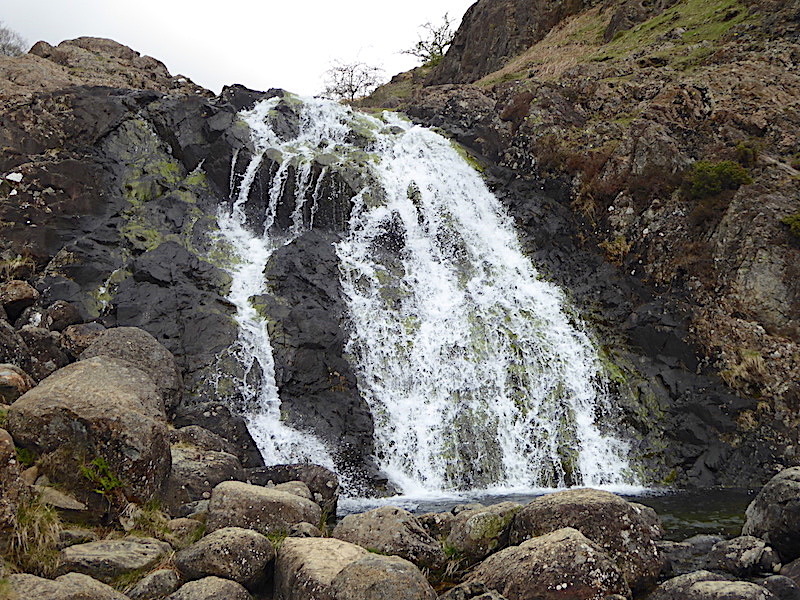 Am I getting into a photographic rut or am I just fascinated by waterfalls, I wonder? 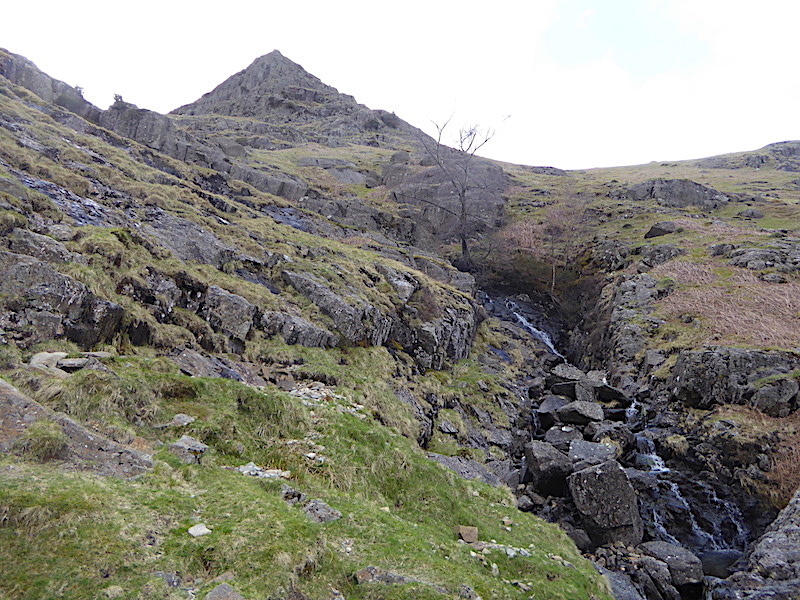 Above the falls now and the path has rounded the crest of the fellside leading us on towards Easedale Tarn. 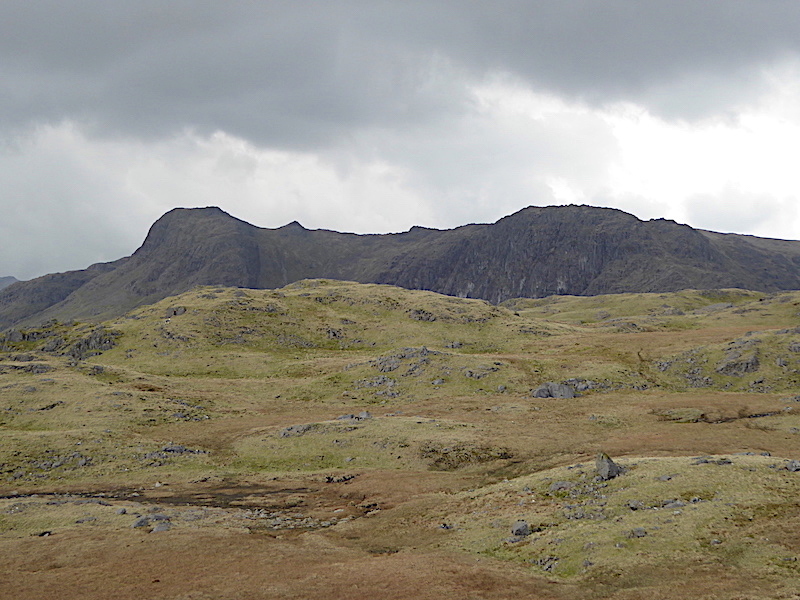 Hmm, its looking a whole lot bleaker up ahead with Tarn Crag, in the centre, looking distinctly unwelcoming. Still, its nice enough along here so we enjoy the sunshine and the gently undulating path while we can. 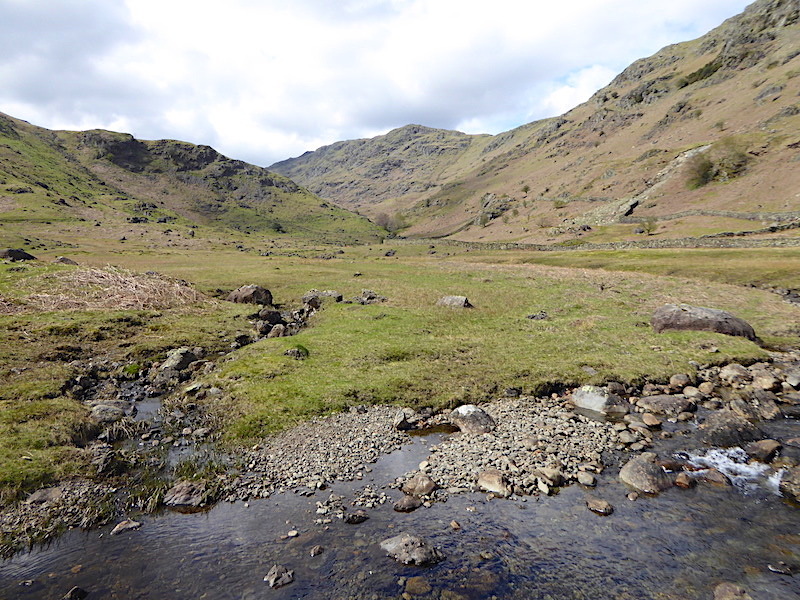 Over on the right of the shot the infant Sour Milk Gill is beginning its journey from Easedale Tarn down to Grasmere. 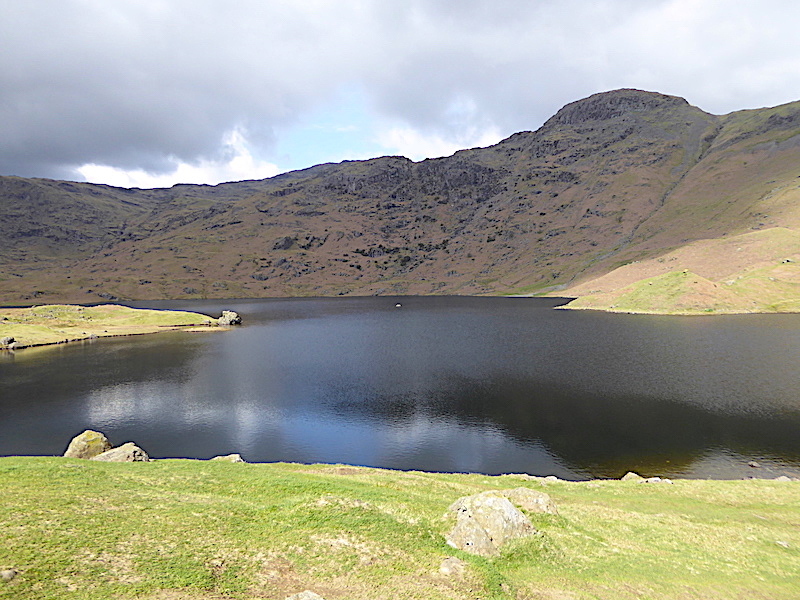 A few minutes later and we arrive at Easedale Tarn with Tarn Crag still under a large patch of cloud and not another soul in sight anywhere. We comment on how unusual it is to be here and not have the company of at least one other walker. Very strange for there not to be anyone at all. Although we’ve only been walking for less than an hour an executive decision is taken. 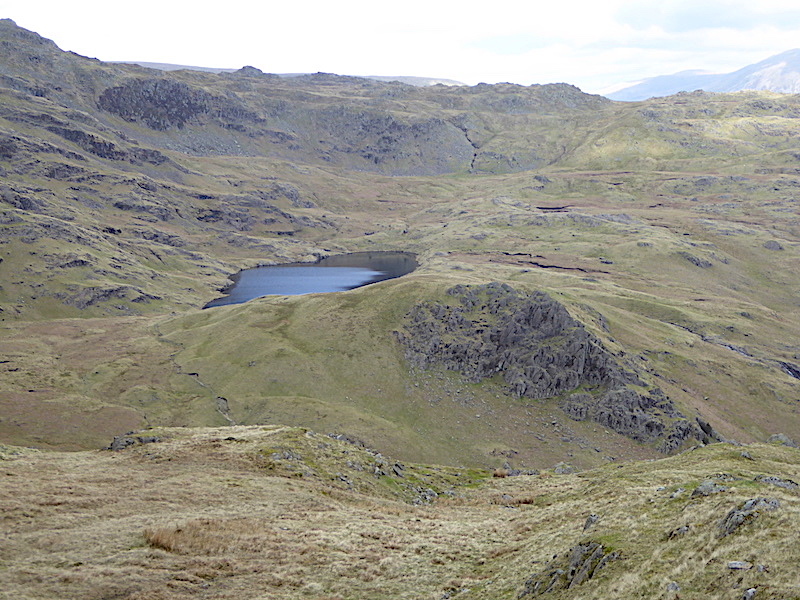 Its deemed a good spot for a Mars Bar/coffee break so we find a suitable perch from which to enjoy it and the view, especially as Tarn Crag has come out of the shadows, for the moment at least, and only the slightest of breezes is disturbing the surface of the water. Conversation turns to previous walks up Tarn Crag in a variety of weather conditions and lots of “Do you remember when …..?” J was last up here a couple of weeks ago with a bunch of his pals from the voluntary group he belongs to so he had some reminiscences spring to mind from that outing too. Its amazing how just looking at something brings all manner of half forgotten incidents right back into focus. 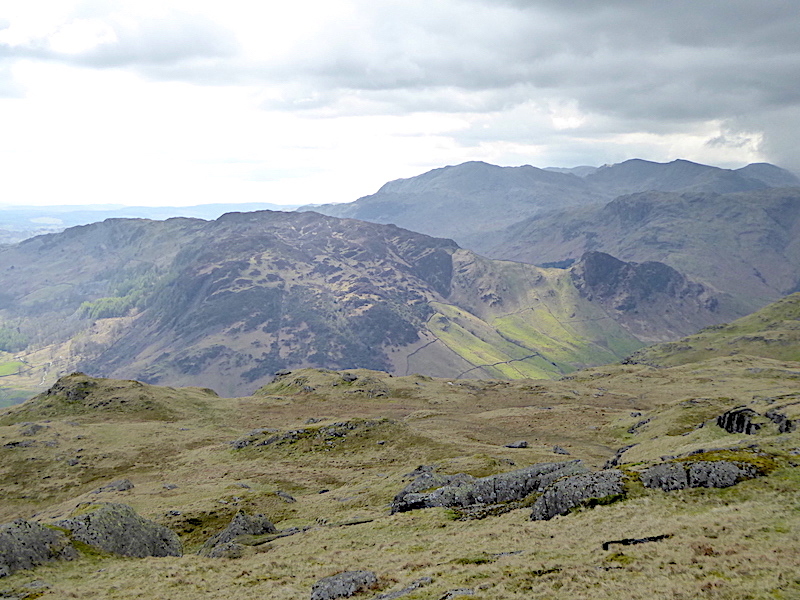 A look to our left from our perch for this shady view of Blea Crag, to the left of centre on the skyline, and a discussion about back pain and the feasibility of going up to Blea Rigg. The painkiller tablets and walking poles seem to be helping things along fairly well and there’s a not too strenuous ascent path to use for the ascent so we decide we’ll carry on for the time being. Coffee break over and done with so I took a shot looking towards Seat Sandal and Fairfield from the site of the old refreshment hut which used to stand here. For more information about the refreshment hut here’s a link http://www.pastpresented.ukart.com/easedale-hut.htm and from the photos displayed there it seems that one of the hut walls was built around the huge boulder in the shot. Well you can’t let the simple matter of a boulder get in the way of a good business venture can you? We continue along the path beside the tarn for a short way before breaking off to the left to pick up the path across the slopes below Castle How. The green path is clear to see in the centre of the shot to the left of the small hillock on the right. The flat area at the bottom of the shot is quite marshy so we skirt round it. We had quite a long sunny spell as we climbed across the slopes so it was a very pleasant little interlude with an easy to follow track. It won’t be quite so straightforward perhaps when the bracken is up and the preponderance of dead bracken stems lying around illustrates just how much of the stuff there will be across here come the summer. I have already spotted one of the little tykes pushing its way about three or four inches above the ground so its flexing its muscles already, grrrr. 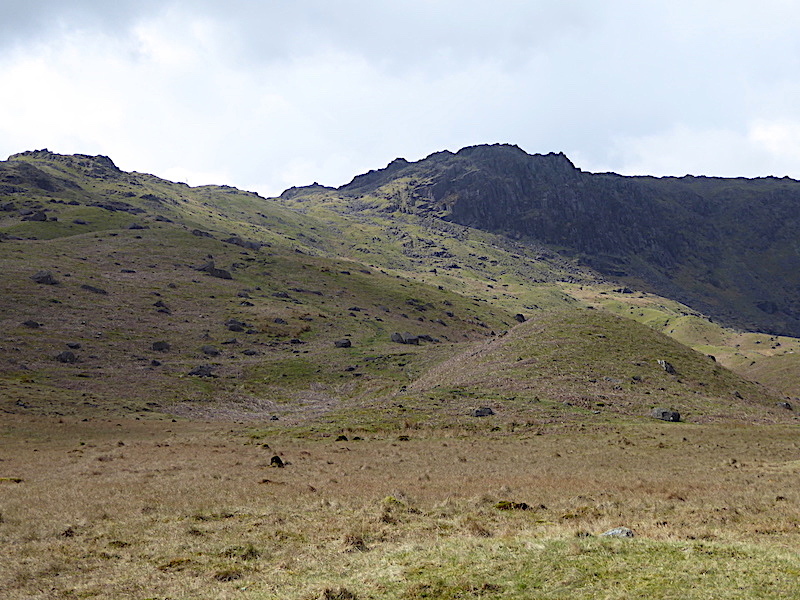 This view up the valley towards Belles Knott, the pointed grey area pretty much in the centre of the shot, shows our planned return route back down to the tarn …..
….. and, speaking of which, here’s a look back at it from a little further along. Higher up and the views to the east begin to materlialise. 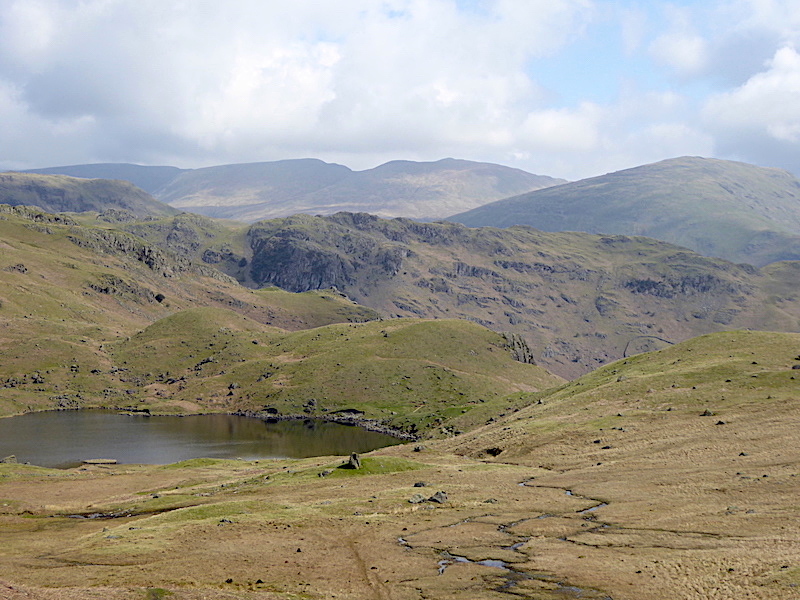 In the middle foreground, beyond the little green knolls around the tarn, is the long ridge between Helm Crag and Calf Crag. Behind it, to the left. 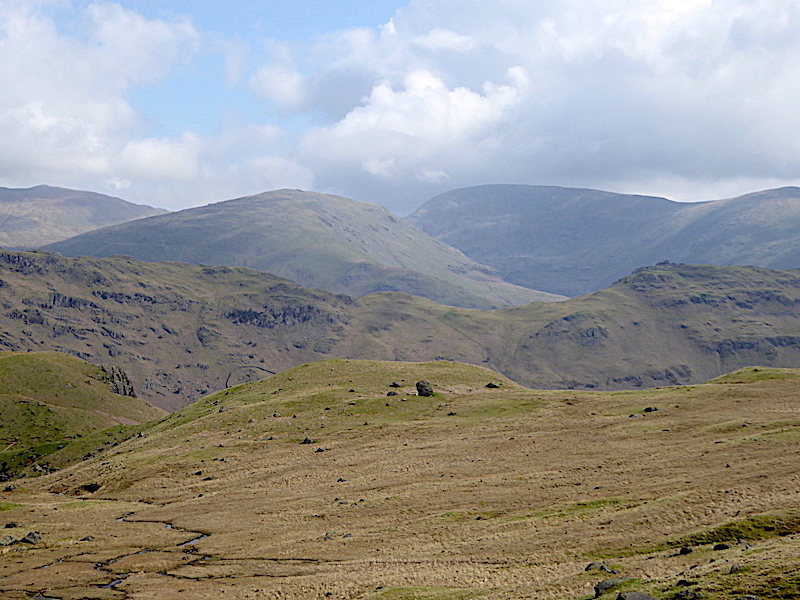 is Steel Fell with Seat Sandal behind it on the right, and the Helvellyn range on the skyline. 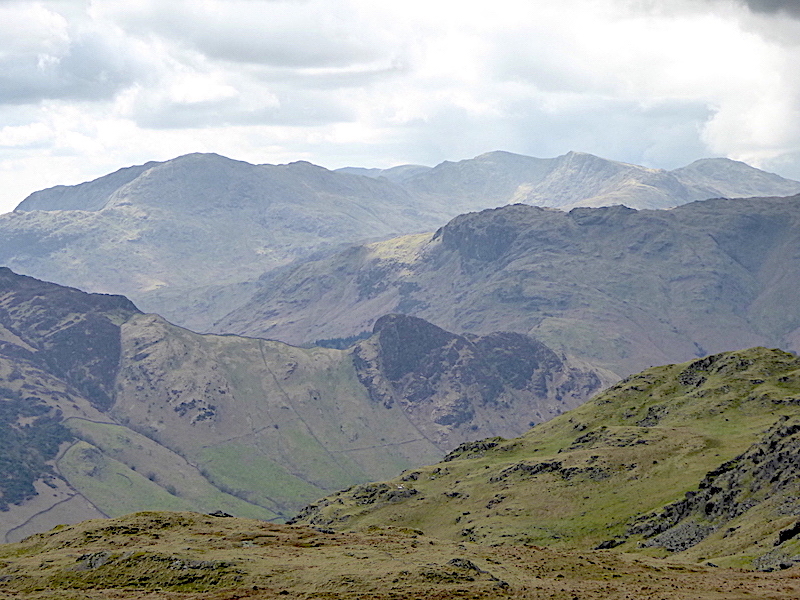 A closer look at Seat Sandal and Fairfield beyond the Helm Crag ridge. 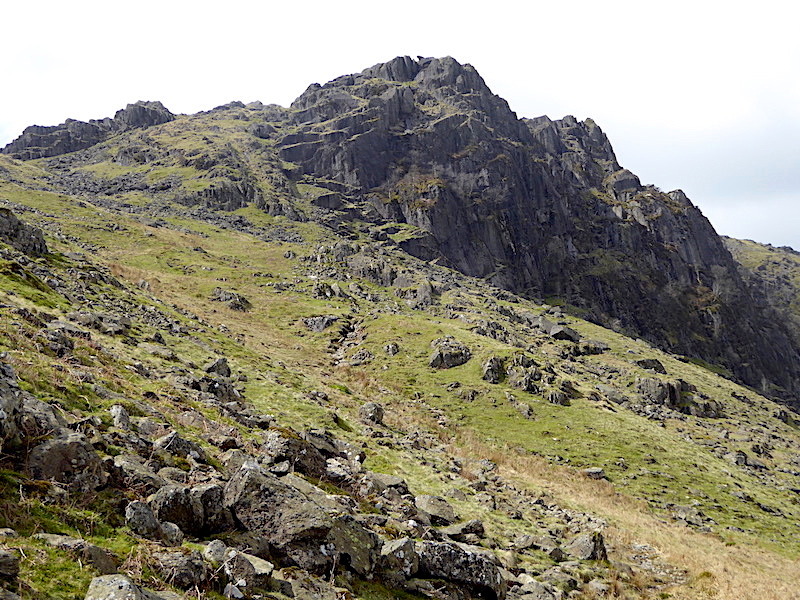 Approaching Blea Crag where the path swings over to the left to avoid climbing it. Of course you can always clamber across it if you are feeling sprightly and full of vim and vigour. Not having any of those qualities in any great quantity at the moment I stick to the path and its nursery slopes. Well, perhaps not very nursery but certainly not as in your face as the crags are. 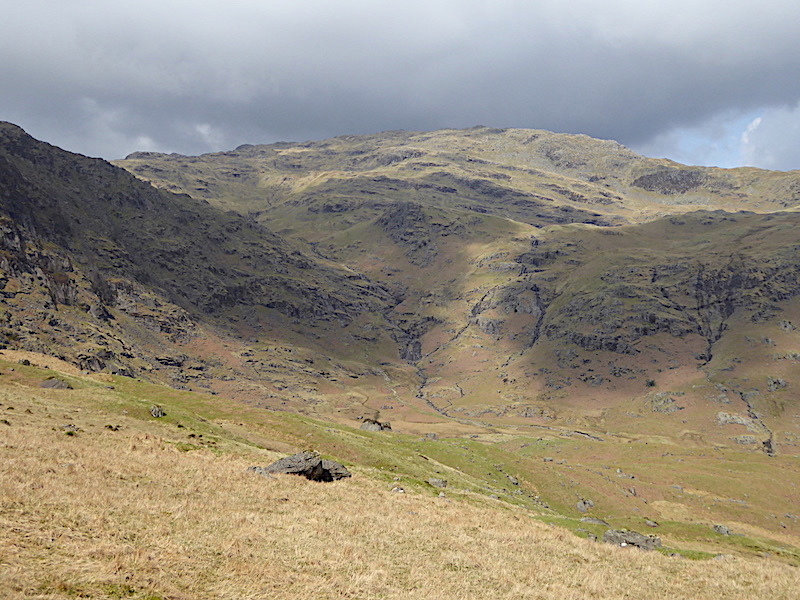 Another view of our return route below Belles Knott, the craggy area in the centre of the shot. On the skyline high above it you might just about make out the little grey point marking the summit of Sergeant Man which is still getting some sunlight despite that huge lump of cloud above it. 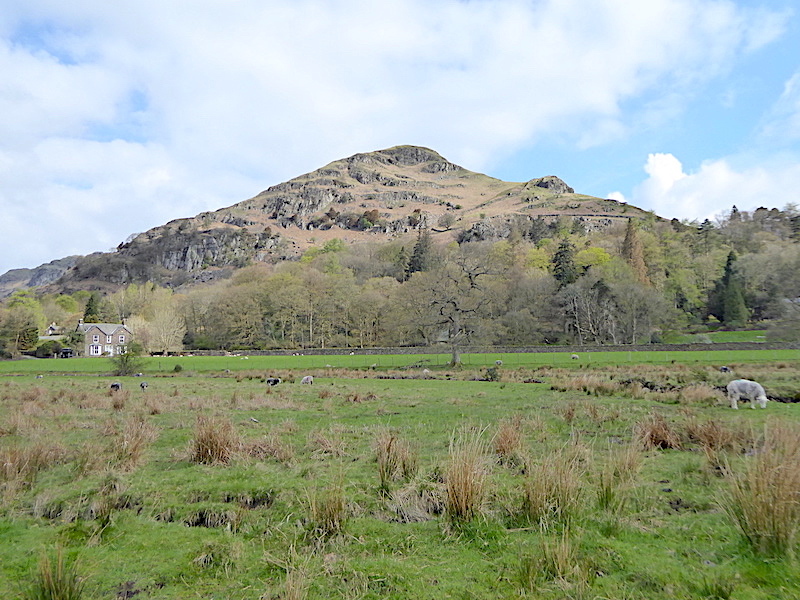 We have not even considered carrying on up there from Blea Rigg. Its one of those paths which feels like a climb that’s never going to end with a summit always just tantalisingly a little further ahead. Definitely not a climb my creaking muscles would thank me for today. Another look back to the tarn and the fair weather over the eastern fells, but we are still doing well enough over here so we have no reason to grumble or wish we’d stayed over there. 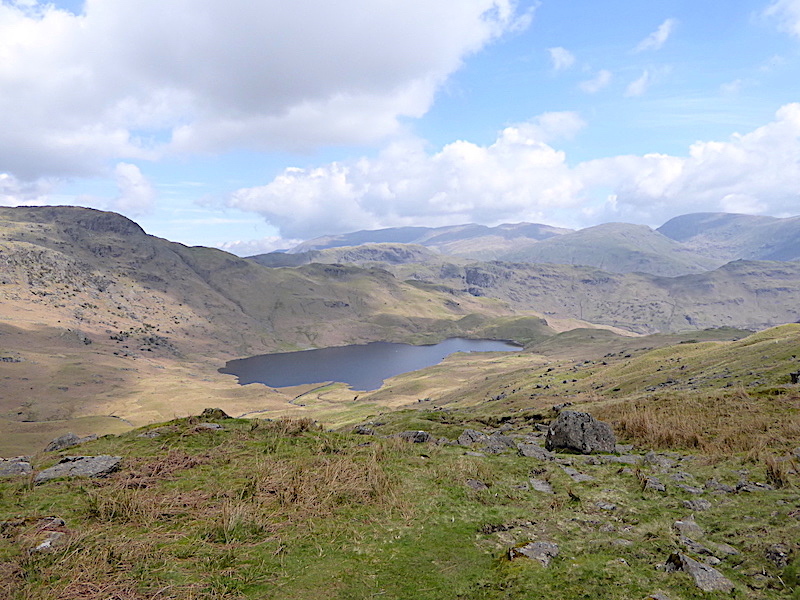 We’re on the last section of the climb up to the ridge now and more or less level with Great Castle How which is directly opposite …..
….. with another look back at the tarn and the eastern fells. Up on the ridge now and we have just seen a lone walker making his way over to Great Castle How. 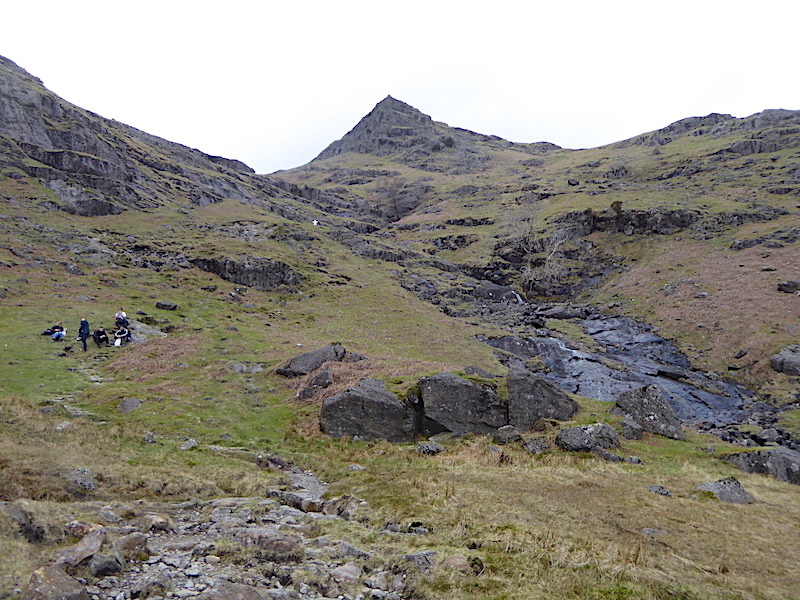 He’s the first person we have seen since we climbed up to the falls in Easedale. He may be making his way across the often confusing ridge to Silver How, but there are numerous paths going every which way so he may have had a completely different destination in mind. We last walked across to Silver How from Blea Rigg on 21 Nov 2015, when the snow was down, it becomes even more confusing when all you can see is white. On Blea Rigg summit where things became a little chillier, the breeze strengthened quite a bit, and the clouds were heavier, thicker and darker. A combination of conditions which didn’t inspire us to linger for very long. This seemed to be the dividing line between the fair weather to the north and east and the much gloomier condition to the south and west. 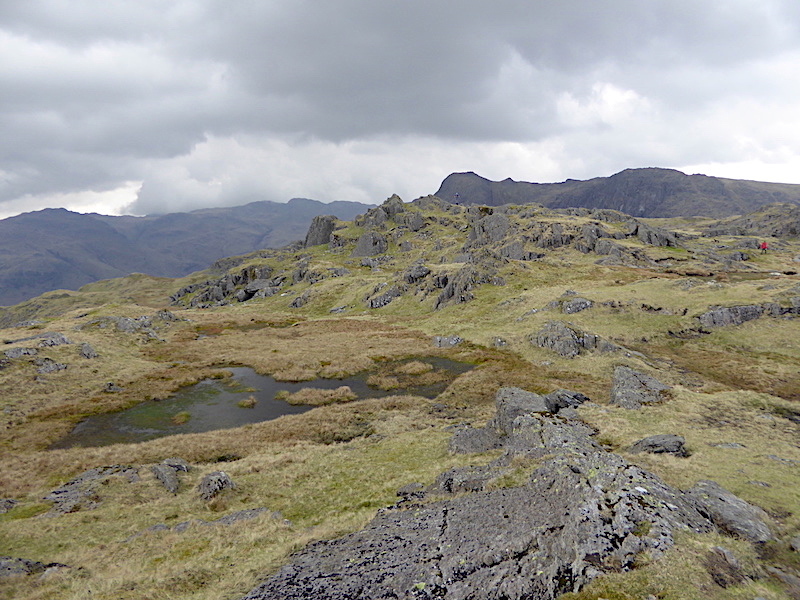 On the centre skyline are the Coniston fells and across the middle foreground to the left is Lingmoor Fell with Pike O’Blisco to the right of it. 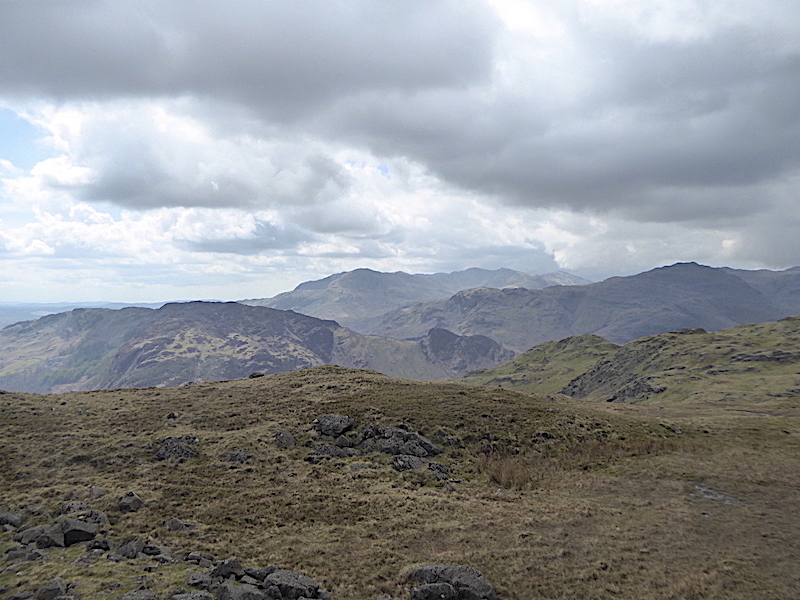 To the west of us a stark skyline view of Harrison Stickle and Pavey Ark. 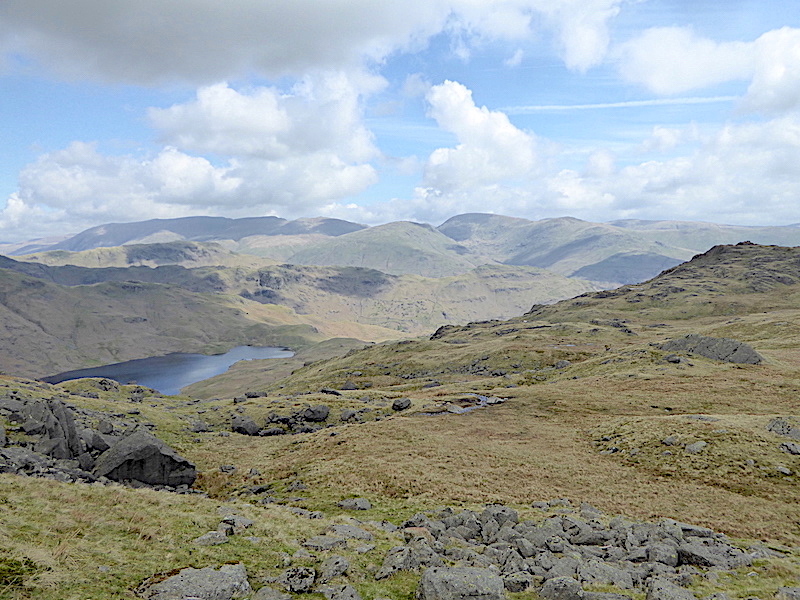 Immediately below us is Side Pike, the heathery prominence on the end of Lingmoor Fell, with a slightly sunnier Coniston group forming the skyline. 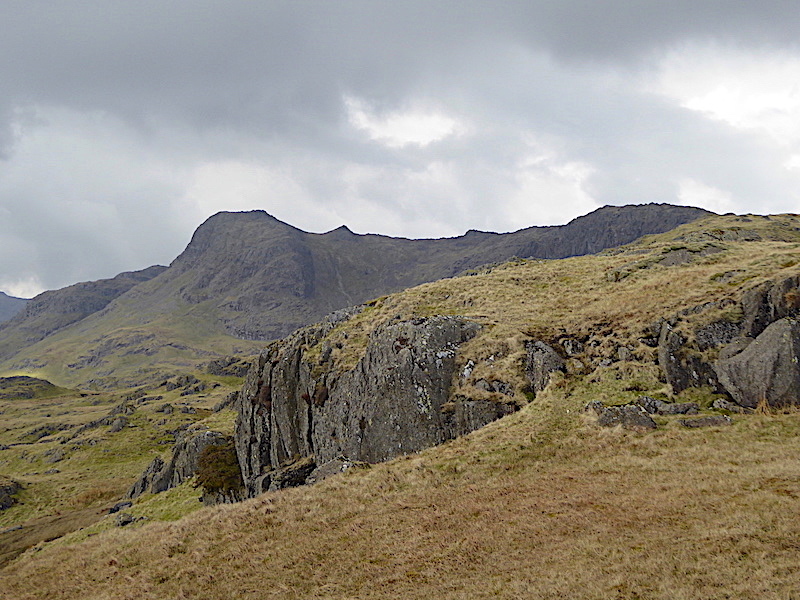 Harrison Stickle and Pavey Ark still looking unappealing underneath that very heavy cloud base. 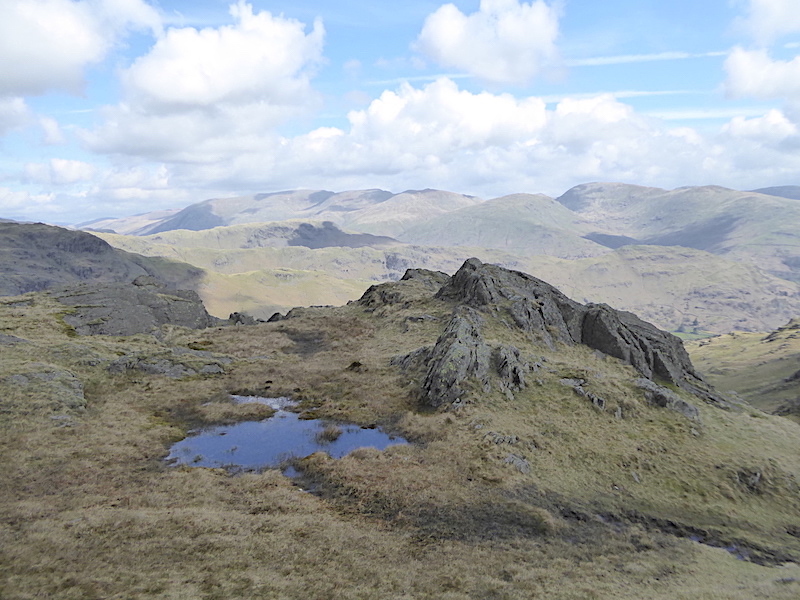 Lovely blue skies and sunnier weather over in the east from Blea Rigg summit …..
….. and Great Langdale below us also gets a spell of sunshine …..
….. as does Lingmoor Fell and Side Pike. 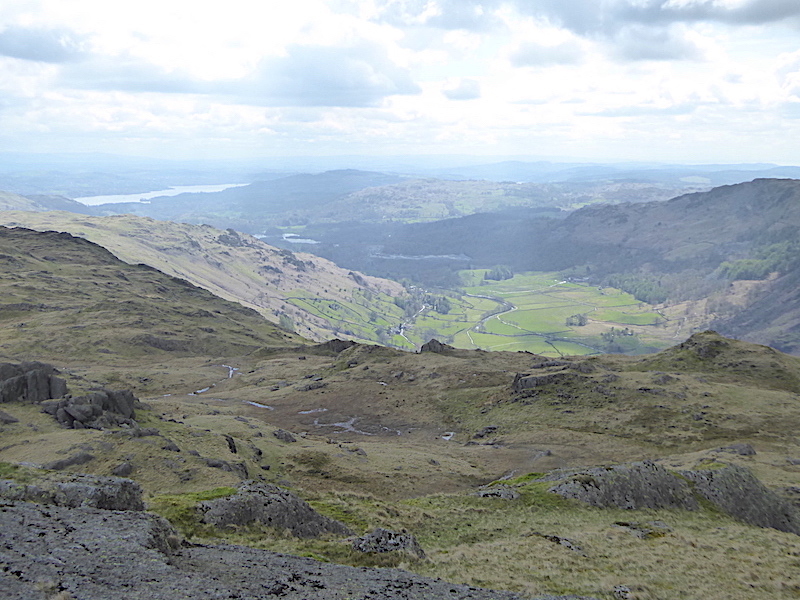 Right this minute it looks like there are warmer places to be than the summit of Blea Rigg. 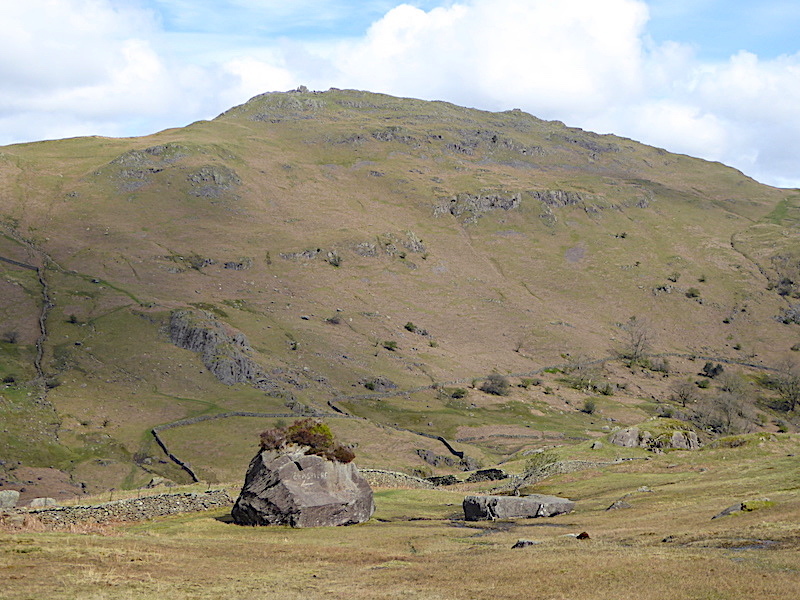 Its not pleasant enough to hang around any longer to we take our leave of Blea Rigg and head off over in the direction of the lady walker in the red jacket over on the right. 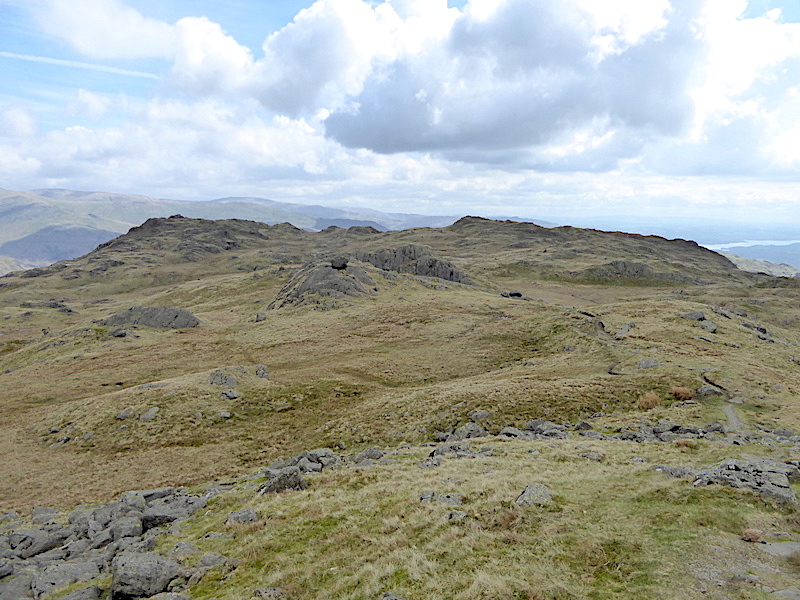 She and her companion have just left the summit although at the moment he’s standing on the grassy area just below the outline of Harrison Stickle but it’ll require a zoom in to see him. 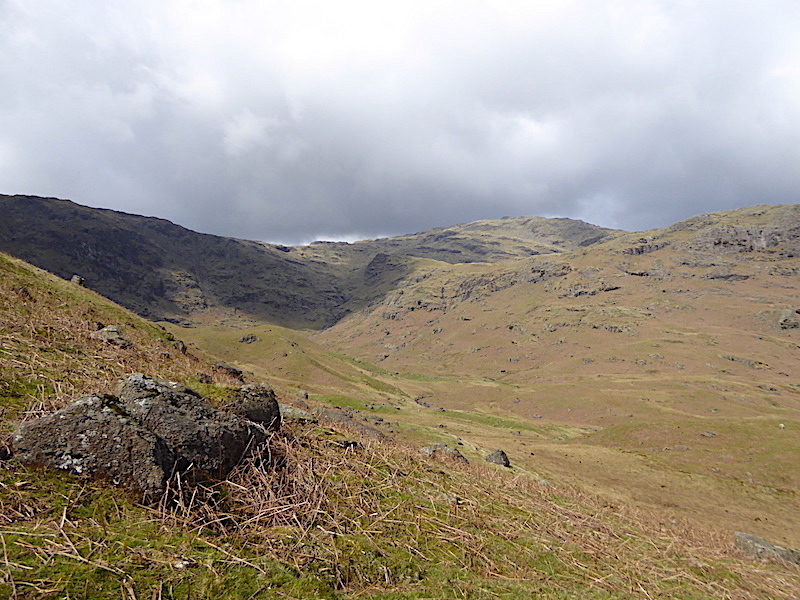 We follow the Sergeant Man path for a while and then leave it to go off path and make our way down the grassy slopes to the path below Belles Knott which comes up from Easedale Tarn. 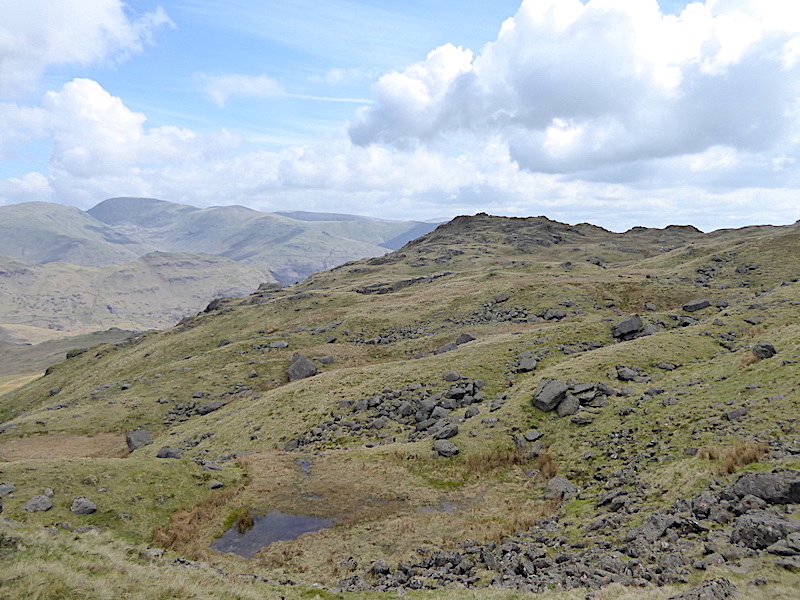 Belles Knott is immediately below us here with Codale Tarn to the left of it. 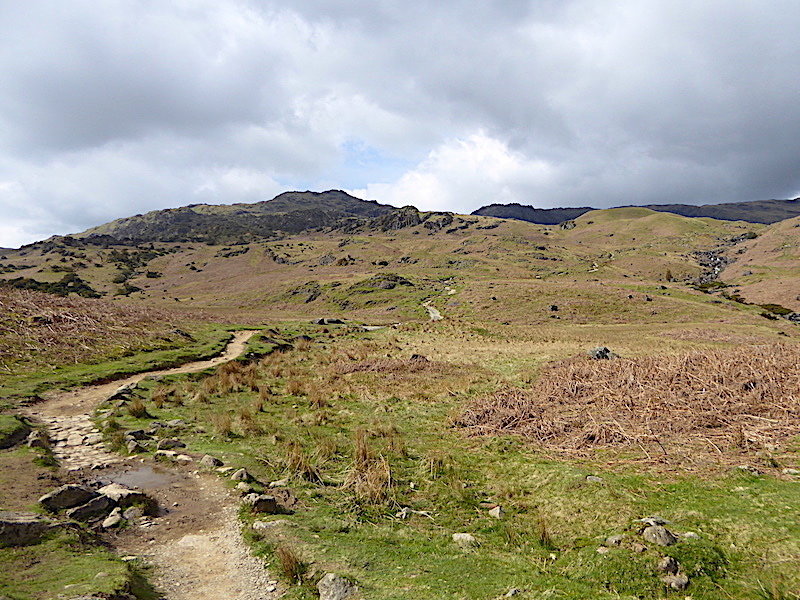 On the established path again and heading back down to the tarn. The dark speck on the path ahead turned out to be three jolly chaps plodding their way up who gave us very cheery greetings in broad Lancashire accents. If they were on their way to Sergeant Man they still had a fair stint of uphill to go before reaching it. 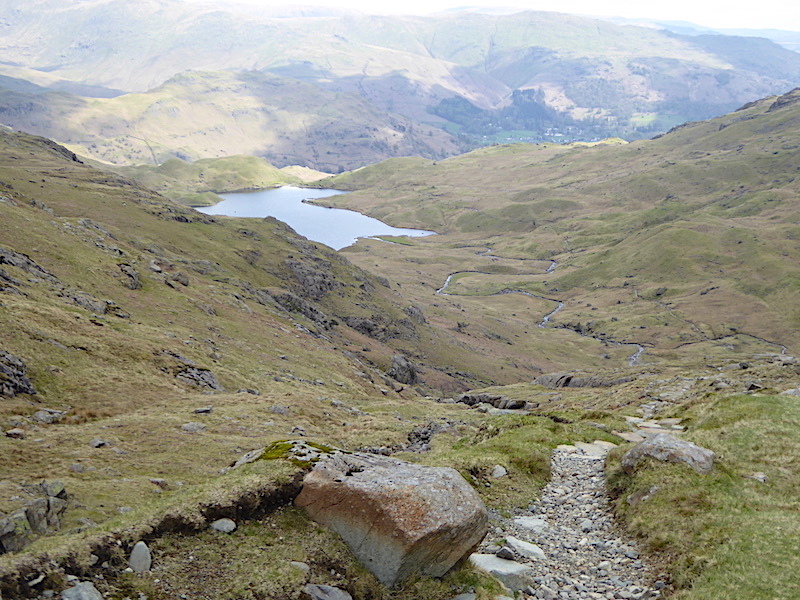 My back muscles saw the descent path and tarn below and were immediately grateful that we were now going down instead of up. However grateful they were I thought it wise to remind them that this descent route is not simple and straightforward. Having descended this way in the past with all body parts fully functioning it was still rough at times so I tried to take as easy a line as possible and try to avoid any unnecessary jolting and jarring which …..
….. can be tricky at times as a look back at the terrain reveals. Plenty of rock slabs. 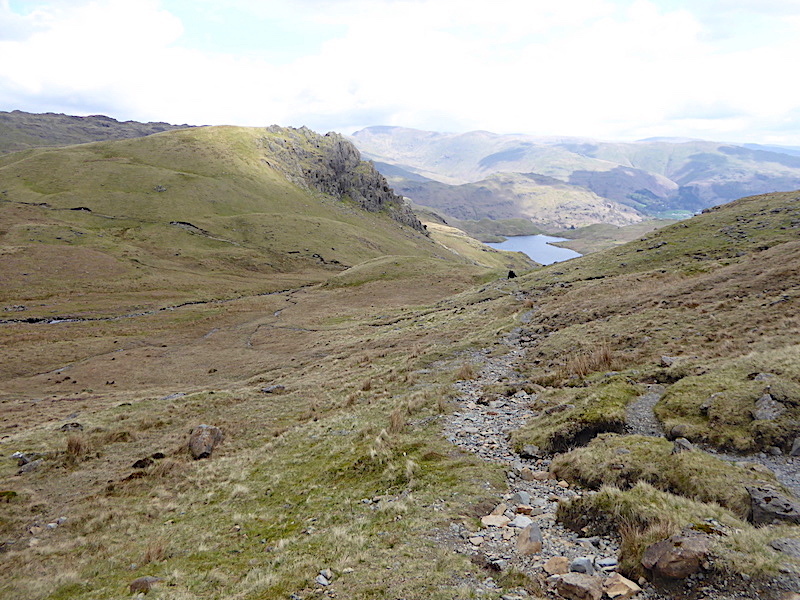 wet areas and a few twists and turns to negotiate before reaching the easier terrain below Belles Knott. Five points of contact instead of the usual two were brought into use over a couple of the slabby sections to avoid any possibility of wrenching the back muscles any further than they already are. Sometimes my legs just aren’t long enough to step down to the next level and no way was I going to risk a little hop down to it as I normally would. 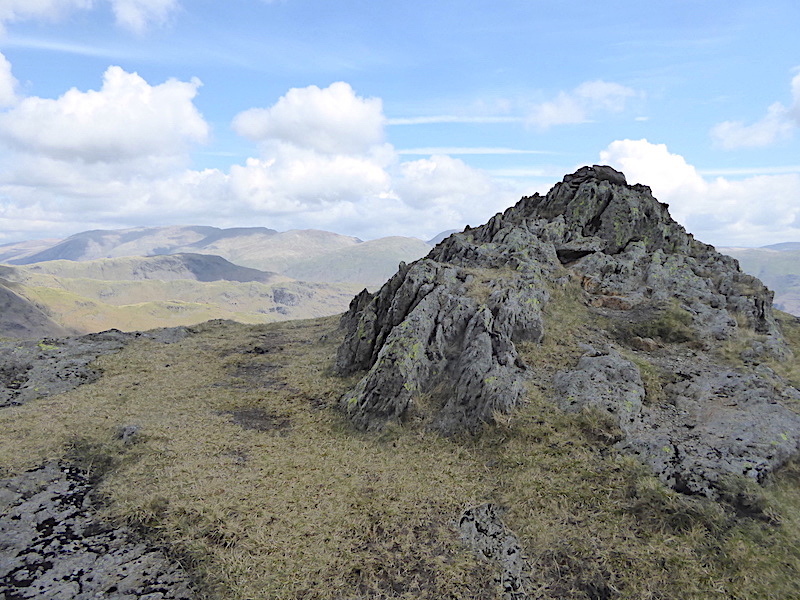 At last the ground flattens out and the opportunity to stand comfortably for a look back up at Belles Knott. The little group to the left were taking a drinks break and probably steeling themselves for the next section of their climb. They didn’t look awfully well equipped either but with youth on their side they probably hared up there in pretty smart time. Flatter ground doesn’t always mean good ground so the stepping stones are invaluable across this very marshy section. 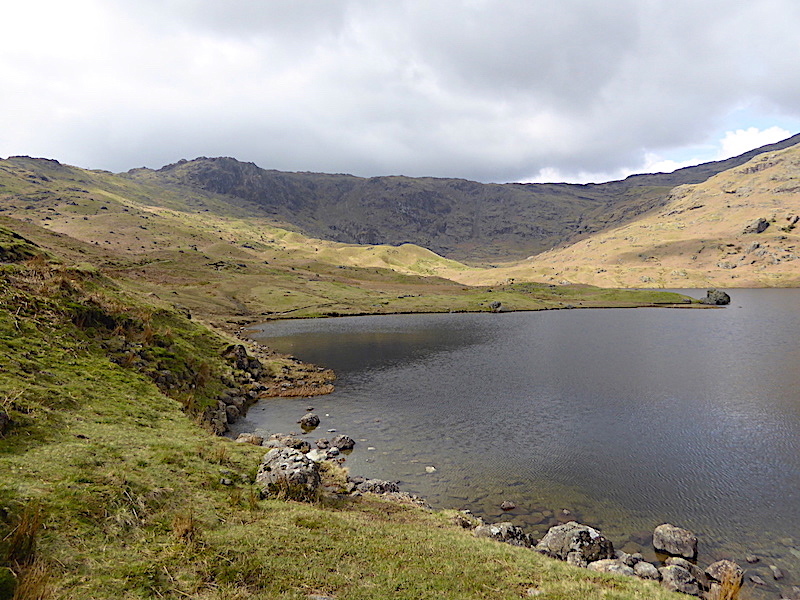 Its just turned 1.00 pm and we’re almost back at the tarn where we plan to stop and have a refuelling break, hoping that the current sunny spell will last long enough for us to enjoy our lunch and the pleasant surroundings. 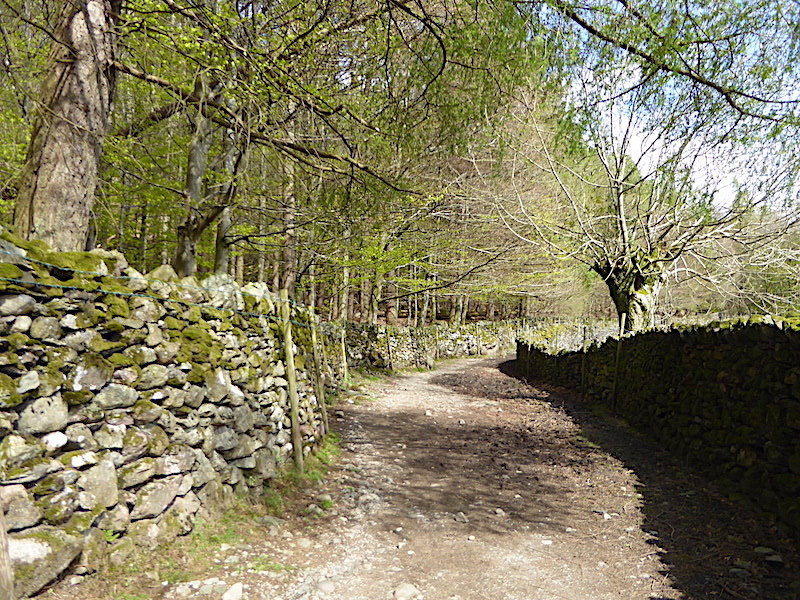 The path along here is easy and enjoyable and we begin to meet more people walking it. Solo walkers, pairs, little groups and one very long line of teenagers with a couple of supervising adults bringing up the rear. We stood to one side of the path to let them all go by and just about every one of them said thank you to us. Its very nice to be given thanks for something you’ve done, but it was even better that they bothered to speak to us at all. Some young people are either too shy to utter a word, or simply ignore us for some other reason. As she passed me one of the young ladies was holding a smart phone at arm’s length above her head, eyes glued to the screen looking eagerly for a non-existent signal, while negotiating a particularly rocky section of the path. All the while I was fervently hoping that she didn’t lose her footing and topple over onto me. Since she didn’t she must be well used to multi-tasking with it. Not only did the sunny spell last through our food stop but it also stayed with us for the remainder of the walk. There were more people at the tarn when we arrived, some having a picnic lunch, others walking around the tarn in both directions, while others were arriving and departing via a variety of routes and directions. 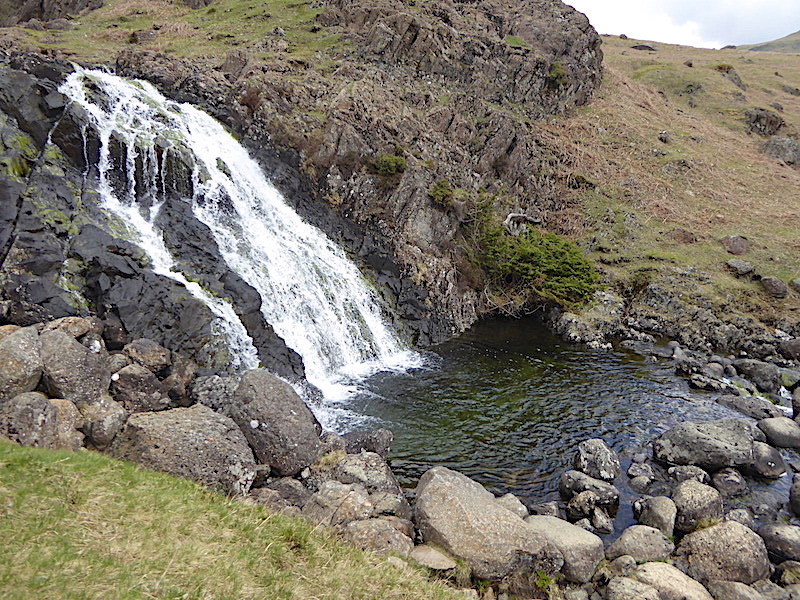 After our break we crossed the outflow of Easedale Tarn and headed for the path opposite which drops down into Far Easedale. 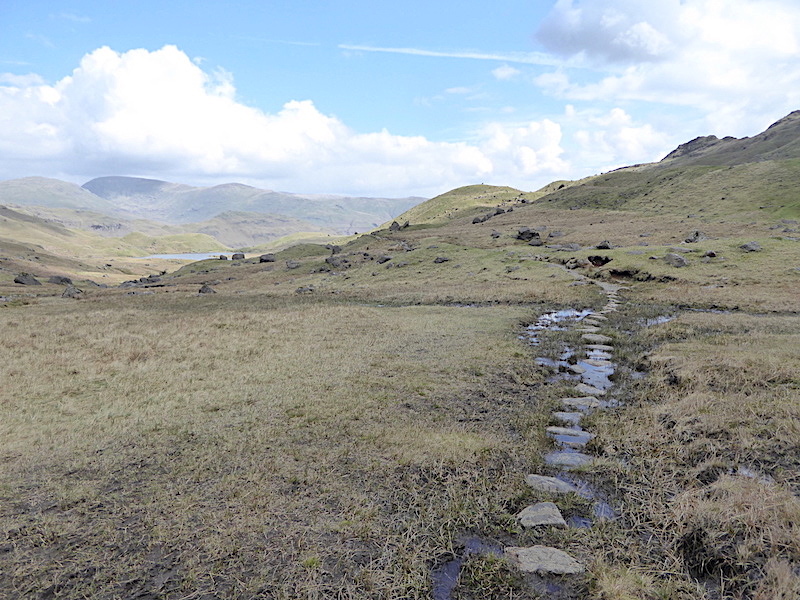 There are a few more boggy sections to negotiate along the way but they also have stepping stones so it was a straightforward descent into the valley. 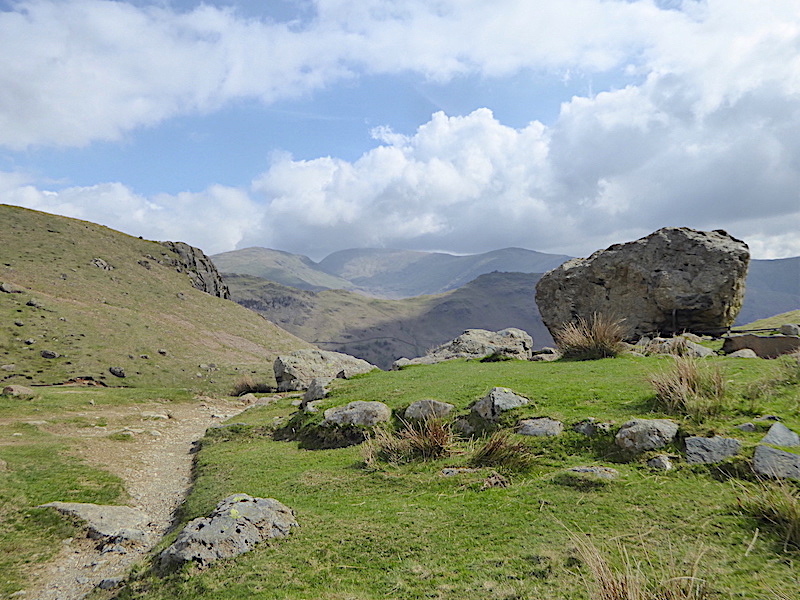 Almost down to valley level now with the view of Helm Crag beyond these two familiar landmarks. 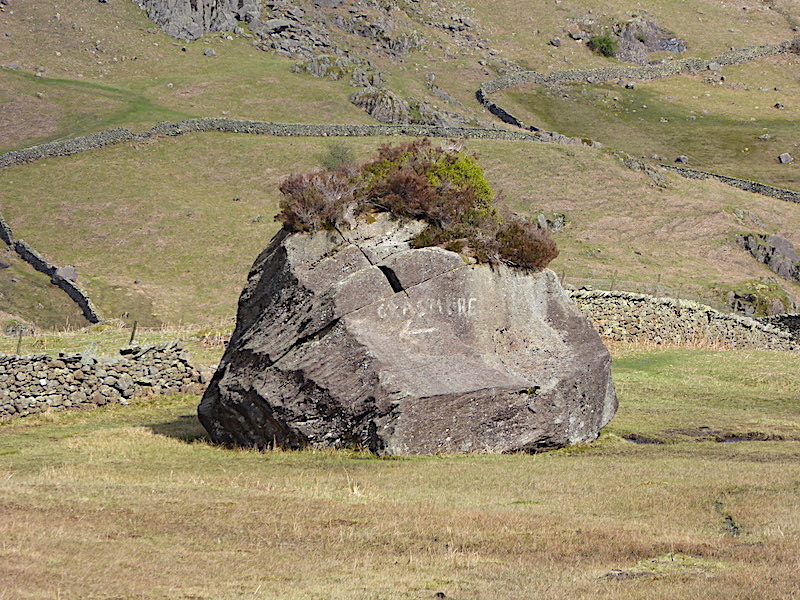 The boulder provides a home for a thriving and bushy topping of what looks like heather and indicates the route back to Grasmere. 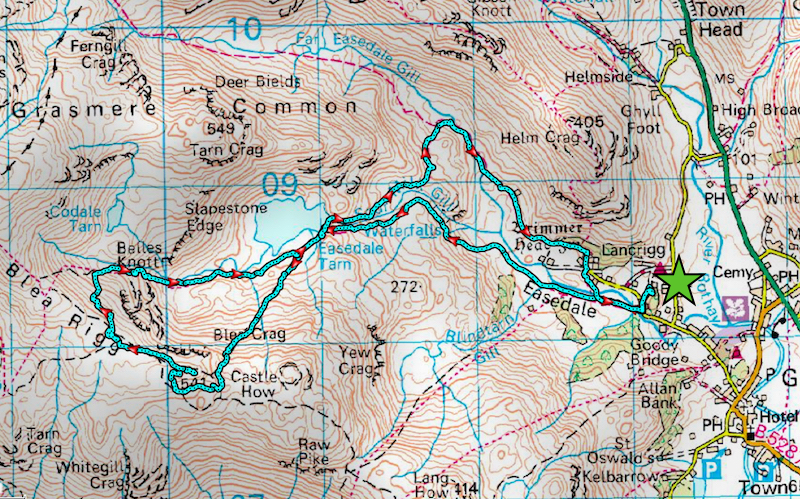 This can seem very confusing if you haven’t been here before since the arrow points to the left and Grasmere sits down the valley to the right. Trust the signwriter and follow the arrow on the path going off left which leads downhill for a short distance before joining up with the path running through Far Easedale. 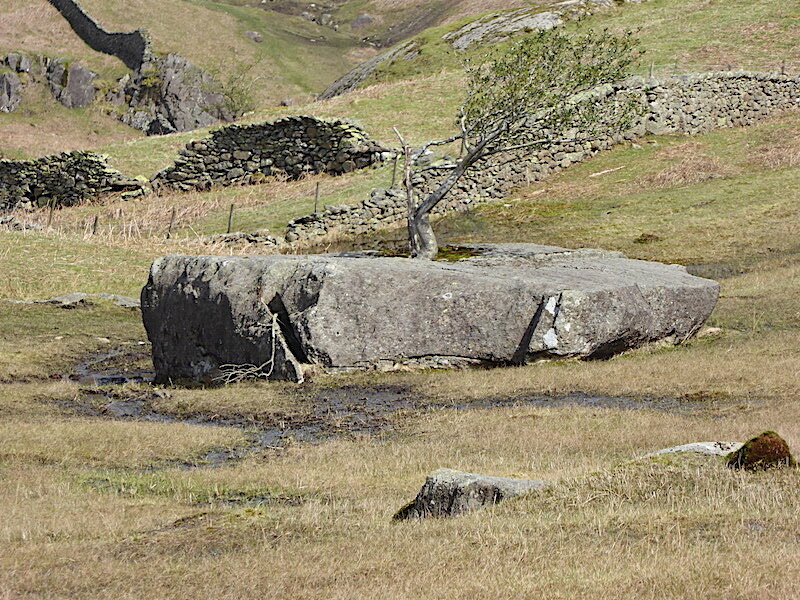 The other familiar object is the split boulder which at some time in the past provided shelter for a tiny seed, cast by the wind into one of the crevices, and which has since grown into this very windblown tree, or should that be bush. Tree or bush, its thriving in its bizarre home and pushing out its new spring leaves. The shape of the trunk echoes what I must look like as I slowly try to straighten up first thing in the morning. 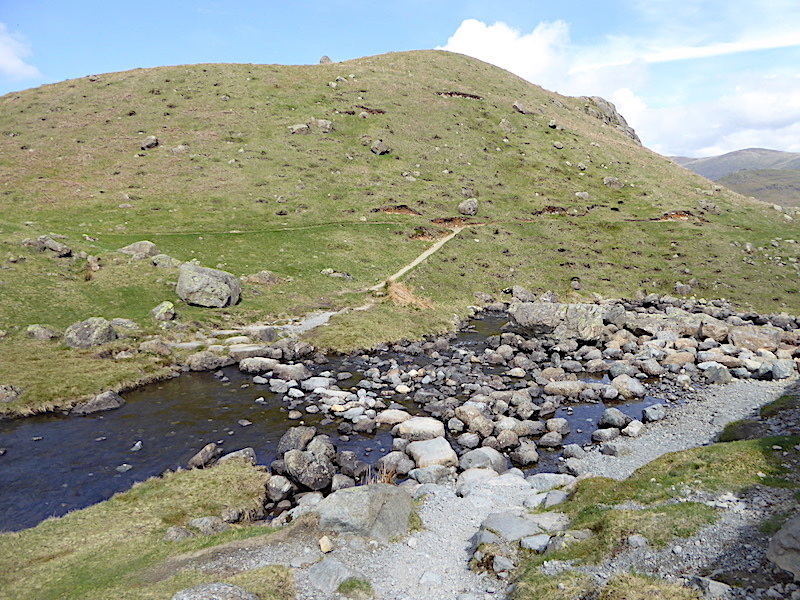 The path from the two landmarks drops down just a short distance and tips us out onto the Far Easedale one just above Stythwaite Steps, so called because a couple of feet downstream from the bridge is a line of stepping stones which a zoom in will reveal. The water level in Far Easedale Gill was low enough to enable us to use the stepping stones but I guess we just forgot about them. I also wanted to take this shot from the bridge looking up Far Easedale with its view of Pike of Carrs on the centre skyline. It looks much more appealing today than it did when we walked up there on 9th Dec 2017. 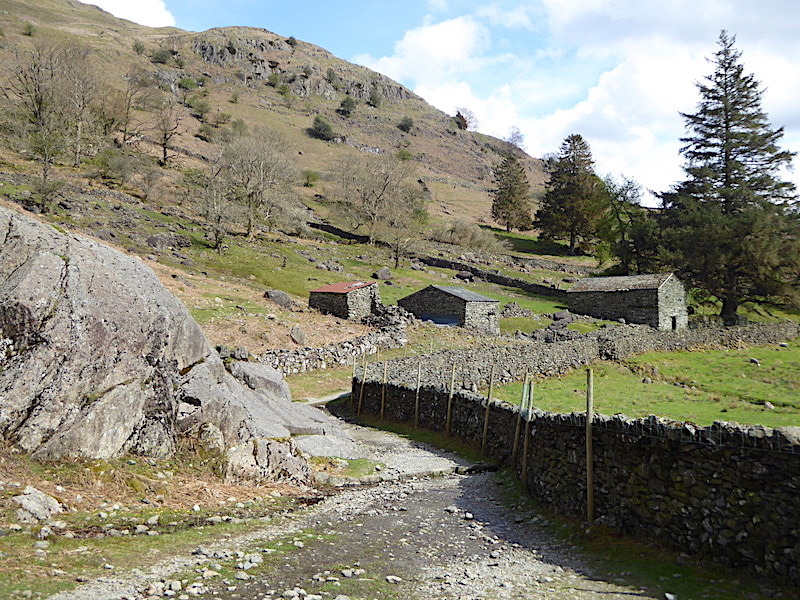 Taking in the views of Helm Crag as we enjoy a warm and sunny stroll back down Far Easedale …..
….. passing alongside these old barns along the way. 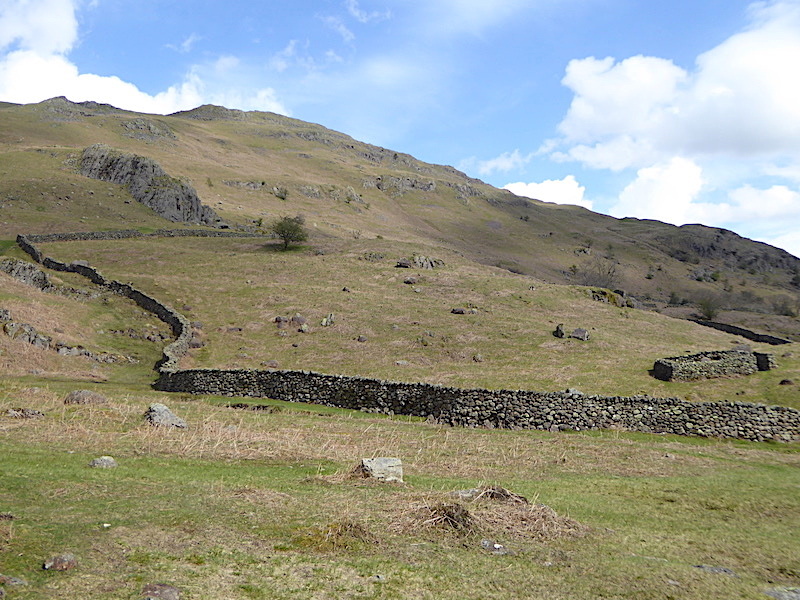 A delightful stroll along the walled track as we near the end of Far Easedale, enjoying the warm sunshine, the blue skies and the fresh green leaves which are just beginning to unfurl, seems like spring has finally sprung at long last. 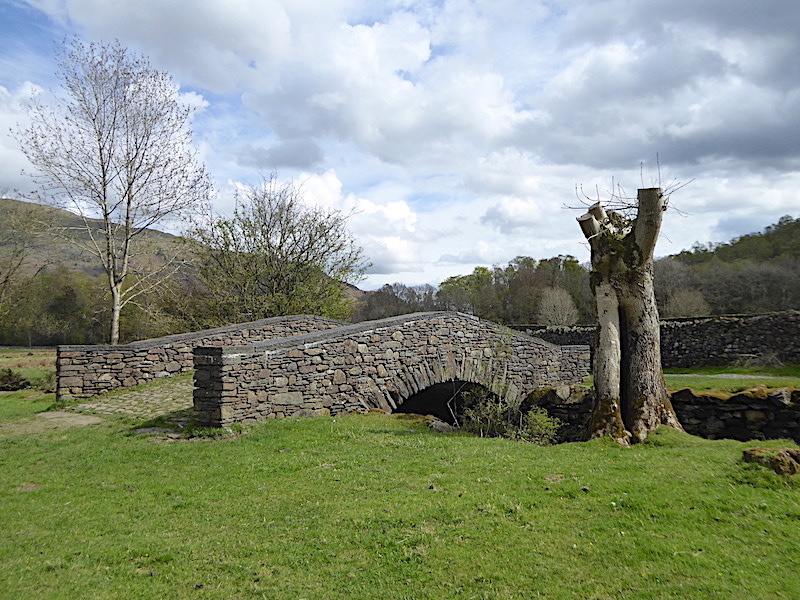 Crossing New Bridge and on the other side we’ll be back on the path we started out on this morning …..
….. which keeps company with Easedale Beck and provides a view of Stone Arthur across the fields …..
….. and which finally brings us back to the footbridge across the beck and the end of today’s walk. From here we have a short walk back to the car and, although it has been a grand little morning excursion in mostly sunny conditions, I think we did as much as was sensible given my not quite so able bodied situation. Keep on with the exercises, it will get better, eventually!